It hasn’t failed yet. I never sleep very well or much at all the night before a race. I think a lot of people are like that. Saturday morning started around 3am for me. I came downstairs, puttered around, read, hydrated, and coffee’ed up. I had laid out clothes the night before, then completely changed my mind about what I was going to wear around 4:45, so I snuck back into my room and in the dark, pawed through my stuff to find the gear I wanted. I ate steel cut oatmeal for breakfast; a great combination of carbs and protein there, plus I add butter and salt, so some fats and that all important sodium. The current flavor of Nuun in house is the Tri-berry, which I can’t say I recommend. I definitely prefer the citrusy-flavors like Lemon Lime and Pink Lemonade. Anyway, I downed a Nuun, and listened to songs I really connect with right now on repeat on YouTube. Right now, those songs are “Dog Days are Over” by Florence + the Machine, “All Summer Long” by Kid Rock, and “Under Pressure” by Queen w/ David Bowie. By 7:30, the whole house was up and ready to go. Henricus Historical Park is a 17th century European settlement; it has been preserved and maintained as a historical reenactment area, complete with wattle and daub houses, a small field of tobacco, and period-garbed reenactors. So for a history-buff like me (though, admittedly, my interests lie about 400 years before this settlement was even thought of), the fact that I have not visited this park that is 5 miles from my house is just ridiculous. And it is a stunning location too, if you can ignore the Dutch Gap coal-fueled power plant that is just off site (easily ignored from inside the park). The Dauber Dash bills itself as a “unique blend of history and nature all rolled into mud” or something like that (it is the quote on the back of my race shirt). It is the PERFECT race for me. We arrived a little after 8am and the close parking lot was long ago full up so we parked over at the aforementioned power plant where there were Chesterfield County school buses waiting to shuttle us to and from the park. That was painless and a lovely sort of treat not to have to hump ourselves all the way back to the park, unlike the Muddy Buddy race. I picked up my number, my Dauber Dash eye black stickers (ha ha) and got in the epic line for a portajohn. From that point on, it was just milling about with the family, getting photo ops and waiting. And waiting. We were in the shade, so it was rather nice there, but the humidity was sky high, to the point we had trouble with our camera lens at first. There was a beautiful view of the river and the park itself is just picturesque. At 9am, the first waves started heading out. The waves were broken up by about 50 people each, and sent out every minute. I was in the slowest wave so I didn’t hit the line until about 13 minutes were on the clock. That is a lot of waiting. However, just like at the Instant Classic, Grace got noticed by the MC and was called over to count down from 5 the start of our wave, which got me pretty wound up. And when Grace got to 1, we were off. The next five miles were a mix of awesome and uneventful. Isn’t it weird to call a 5 mile obstacle race uneventful? But it was. The first obstacle was just before the 1 mile mark, and it was big rolled hay bales (2 sets). I confess were probably the most challenging obstacle I faced all day. They were about chest high, and I had no trouble clearing them (heading out OR when we hit them again on the way back), but the hay did immediately set off my typical grass allergy symptoms, particularly on my arms where I hopped up and rolled over the bales. I already couldn’t wait for a dip in the river to wash off my itchy, stinging arms. Hm. Checking the website, my memory of the obstacle course does not match their list. Maybe my memory is out of whack, but I remember it differently. The next obstacle I met was an army crawl under the ropes. No problem there except banged up knees. (I think they swapped the army crawl and high stepper on the map). Right about the 2.5 mile point, or half way, we hit the first mud pit. Yay mud! It was nicely paired with a short dip into the James River, sufficient to slow you down and get you washed off. 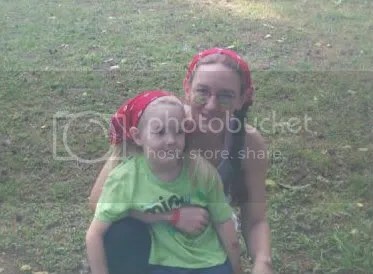 Right after the mud and the short wade into the river was the picnic table crawl. Now, this I thought was probably poorly timed on the course because all those wet and muddy footprints made those 4 picnic tables exceedingly slick. I was cautious but I had bunched up with other runners, so I tried to pick up the pace and hurry as much as possible over the tables to get out of “traffic” (not that it was ever truly crowded on the course). We hit a water stop shortly thereafter, and yikes, that was the last one until after the 4 mile marker. In this phase of the race, things start getting jumbled in my brain. I know there was another army crawl under ropes, and I know we did the “high stepper” through a cargo net, but details of which came when are hazy. The next thing I do know for sure came a much longer run through the James. This was a SLOW slog. I even swam a bit even though the water was only waist deep. No reason to rush there. I am completely inept at swimming in shoes. After that it was into the part of the race that reminded me so much of the Instant Classic. We got some hills and some fun trail running. I LOVE trails. They called the first epic hill “Mt. Malady’s Climb” which was fun, but I was soaking wet from the river and getting more and more weighed down with water and dirt. Then we ran along the trails for a while before coming back down a fun steep downhill. The trail took us to the Henricus Hill which was so steep, they attached two ropes to trees at the top of the hill, and I happily employed them to pull myself up and over as fast as I could at that point. Soon after that, I hit 4 miles, or rather, the 4 mile marker hit me. Like a ton of bricks. I had a major stitch in my side at that point and I could not get a handle on my breathing. I had pushed as fast as I could through all those obstacles, and now my clothes were adding easily an extra 10 pounds and I was wearing down. I regret not bringing along an energy gel now. Anyway, at this point, the course had completed its loop and we were into the “stick” of the lolly pop route, going back the way we had come. I was very thankful for the waterstop in that last 3/4 of a mile, the first one we had hit on the way out. Once more back over the hay bales, which was frustrating because the people I was with were slowing down to crawl over them rather than hopping up like we did earlier. With two ladies stopping in front of me, I lost my forward momentum and had to wait for them to work their way over. I hate waiting. Once they cleared I had to back up to rebuild some momentum and hopped up and pushed over, just like earlier. Once those were cleared, it was running back into the Citie of Henricus and towards Buttercup’s Mud Pit. Some weird spirit took a hold of me and I started grinning. 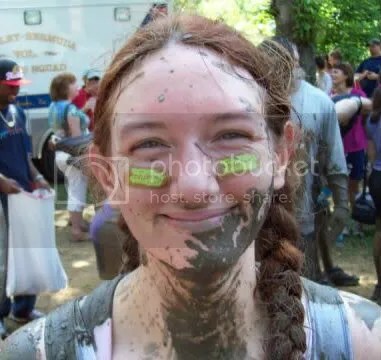 I couldn’t find Byram or Grace in the crowd and I was very focused on hitting the mud as fast as I could duck and scramble under the ropes, but people in front of me again slowed down to almost a stop. I swerved around them and hit the mud. I had decided earlier to make a true spectacle of it and roll onto my back before turning back over and heading out. It felt epic doing it, but the video Byram took doesn’t look nearly as impressive as it felt. Near the end of the pit, a camera guy stuck his camera in my face and asked me to smile. I wonder how that shot will turn out if it ever makes it to the general public. I hope my smile looked as genuine for him as it did in this picture my friend Keith took. I love that the lady next to me is grinning too. My tank top became a mud scoop, and I can’t describe how much weight all that mud added to the remaining few yards I had to go. It didn’t matter though because I was so happy. Keith also took this one. It was crazy slippery coming out of the mud pit and we had a corner to round before hitting the finish line. I was cautious, but I had the energy left to scoot around the people in front of me. Keith got this shot of me, my face set with determination now, getting to the finish. 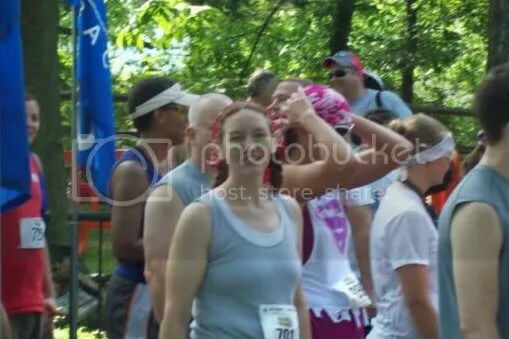 Byram is in the background there cheering me on. I had no idea where he and Grace were, but I figured if I went and sat on a log, they would come find me, which of course they did. Grace was very proud of me. 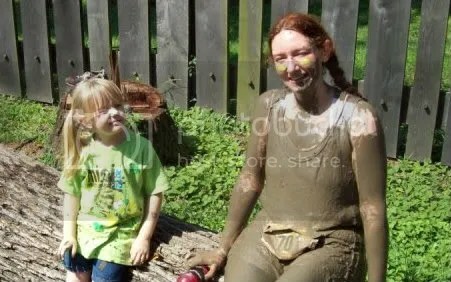 She got quite muddy herself just cheering on all the participants next to the mud pit. Next came my least favorite part of the whole event. The only fly in the ointment. The line to wash off. Warrior Dash does it right with just sending all the participants out into the James River. Here, they had a fire hydrant with a lot of hoses hooked up, but there just wasn’t enough. I suppose there just wasn’t anywhere close by to get the participants directly into the River. It just took forever. I think it was almost 30 minutes before I got a hose. Grace and I disapproved. 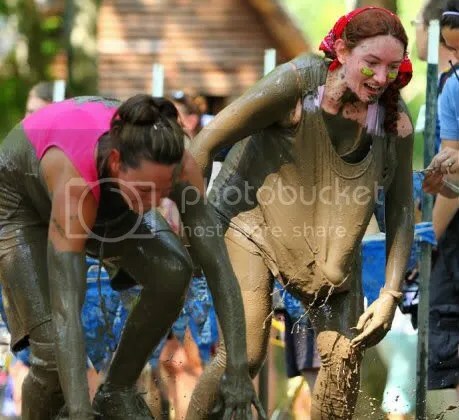 We eventually got there, I removed my shirt in public for perhaps the first time in my life, and Grace and I hosed off sufficiently to get me to the changing tent, where I discovered I probably should have taken more time with said hose, because there was a LOT of mud still left. I had packed clean and dry clothes, but I chose to wear my new race t-shirt. 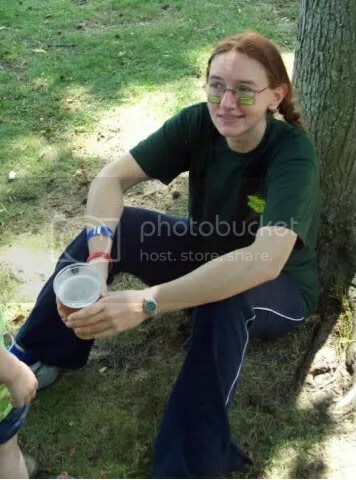 I meandered to the beer tent for my free beer only to discover my remaining options were Miller Light and Coors Light. Yeungling is for people who ran faster than a 14 minute mile pace. I chose the Miller Light (meh), found a tree and enjoyed the atmosphere, breeze, shade, and scenery. Grace played, Byram scouted the site, and I worked to store as much of the race into my permanent memory as I could. I loved this race. It was both easier and harder than Warrior Dash. Warrior Dash is short by comparison. 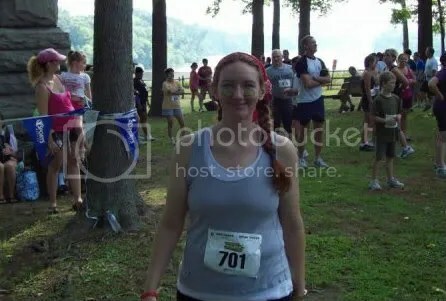 I was going into the mud for the first time at the half way point here, where at the same point in WD, I would have been scaling a 12 foot wall and less than a mile from the finish. 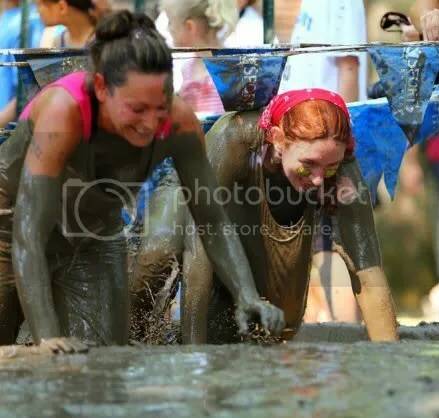 The obstacles were not as intense or demanding as Warrior Dash, but we ran much further with a lot more water and mud obstacles to manage, which adds weight and is hard on feet (or at least on my feet). Warrior Dash requires less training for distance, but more for upper body strength and balance, but the Dauber Dash is not something I would suggest for someone who hasn’t run at least a 10K before. It does require some distance training. 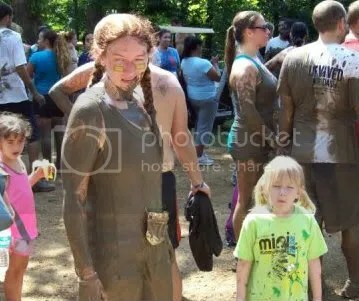 It was in some ways more fun than Warrior Dash because it was much more family friendly. My family was also better prepared, and Byram and Grace were comfortable and able to make their own fun while they waited on me. That alleviated the stress on my mind that Warrior Dash could not. I HIGHLY recommend this race and I can’t wait to get another shot at it next year.